In large Dutch oven, melt shortening over low heat; add flour and cook, stirring, until brown, about 10 minutes (do not hurry; if flour burns, roux is ruined). Add onions and bell pepper; cook until onion is translucent, about 5 minutes. Slowly add warm broth; stir until broth reaches a boil. 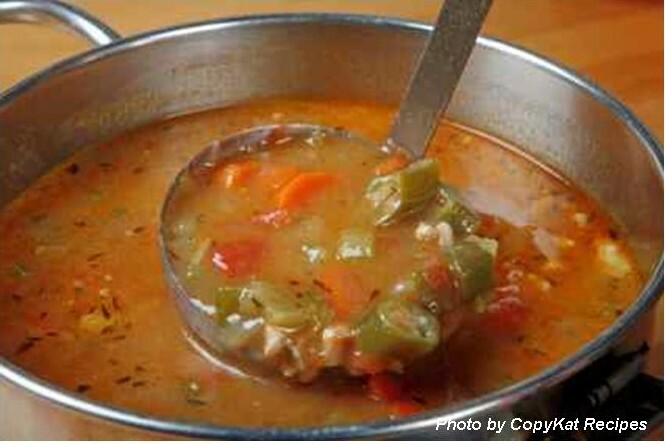 Add tomatoes, okra, rice, celery, salt, file’ gumbo, pepper, thyme and bay leaf; bring to a boil. Add chicken; when mixture boils again, reduce heat to low, cover and cook about 20 minutes. Stir and cook, covered, 20 minutes longer.